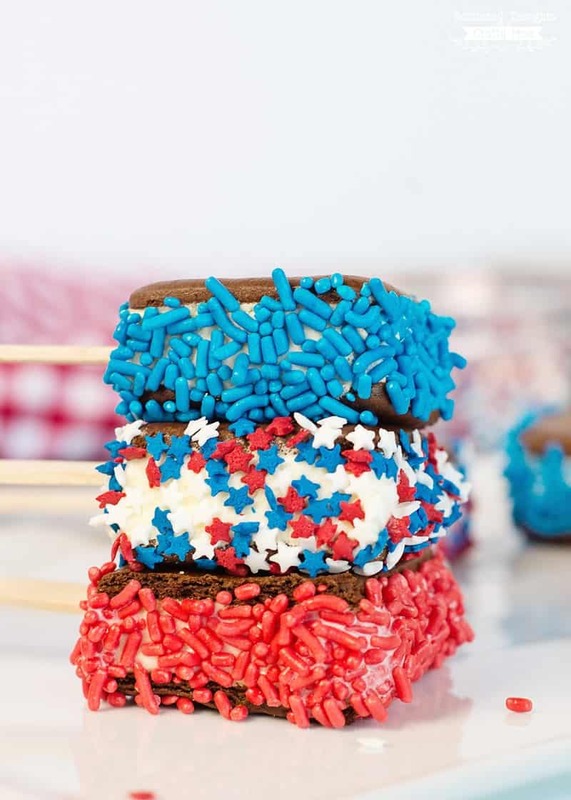 These Sprinkle Dipped, Red, White and Blue Ice Cream Sandwiches are the perfect patriotic dessert for the kids to make! The kids and I have been busy crafting for the upcoming Fourth of July holiday. 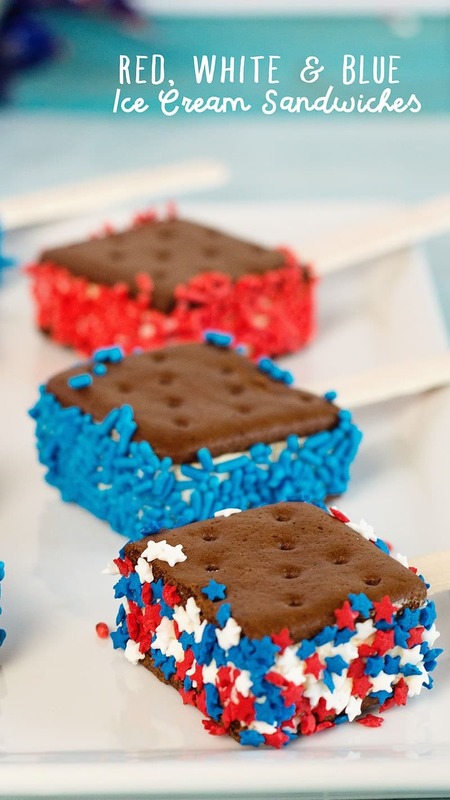 We’ve been making shoelace bracelets, beaded t-shirts, embellished flip flops and this afternoon, we made these adorable Patriotic Ice Cream Sandwiches. And yes, they definitely taste as good as they look! 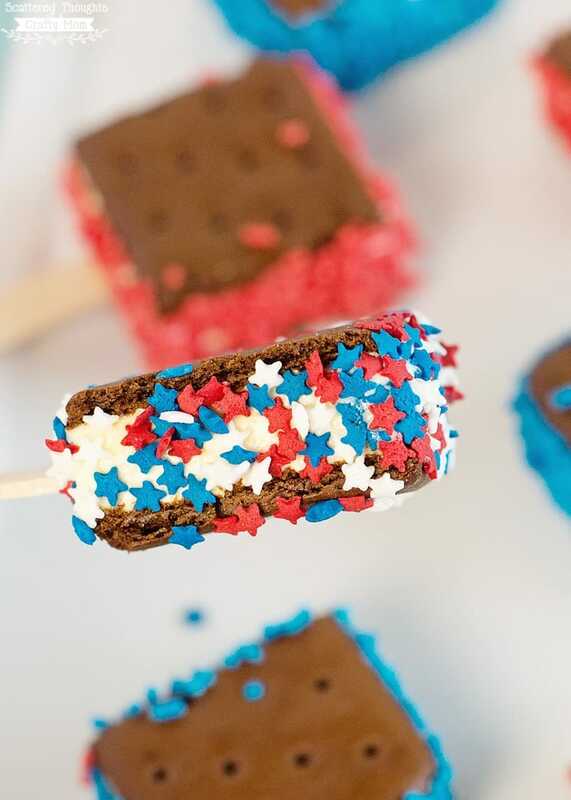 If you do one thing in the kitchen this summer with the kids or grandkids, these little sprinkle-dipped Ice Cream Sandwiches are a must make. They are so quick and easy; the kids will have a blast dipping the sandwiches into the sprinkles and then eating them too! 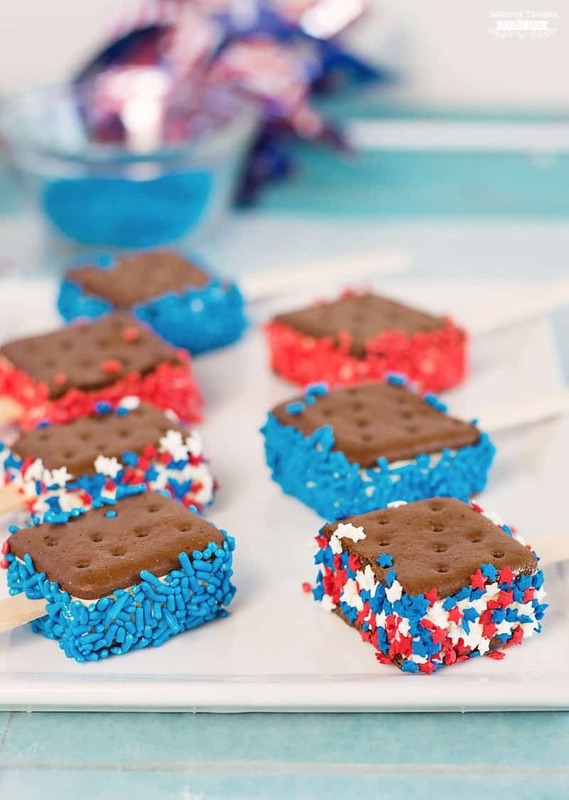 I found these red, white and blue sprinkles at Wal-Mart (along with the popsicle sticks and ice cream sandwiches) but Amazon always has a great selection of sprinkles too, if you like to order online. 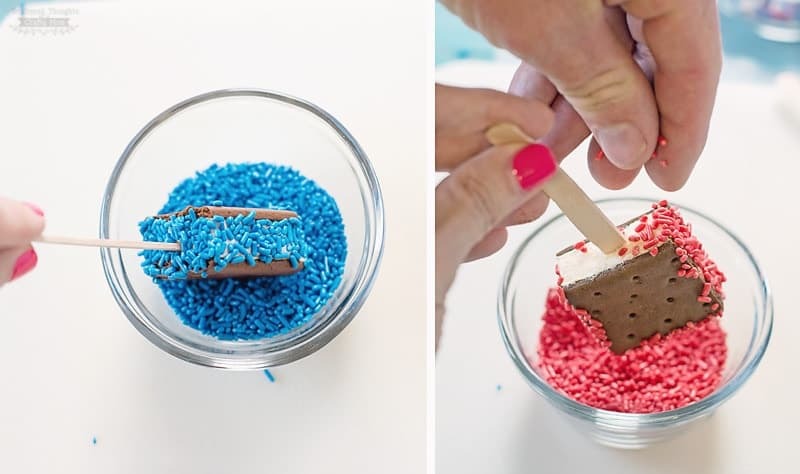 This simple sweet treat is the perfect hands-on project for the kids, plus depending on the sprinkles you chose, they can be a great little party craft for almost any occasion. 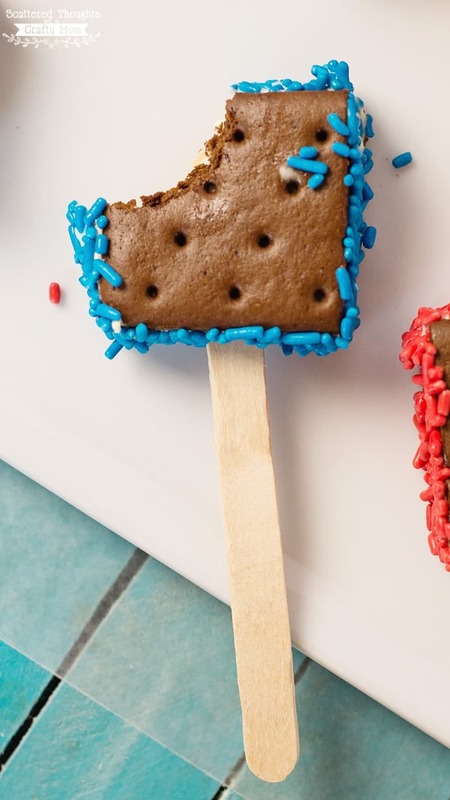 To make the treats, cut the sandwiches into 2 to 3 pieces (leave the paper on when cutting – you’ll avoid getting fingerprints on the sandwiches) and stick the popsicle sticks all the way through the sandwich. Dip the sandwich into a bowl of sprinkles. Don’t forget to add a bit more to the top. 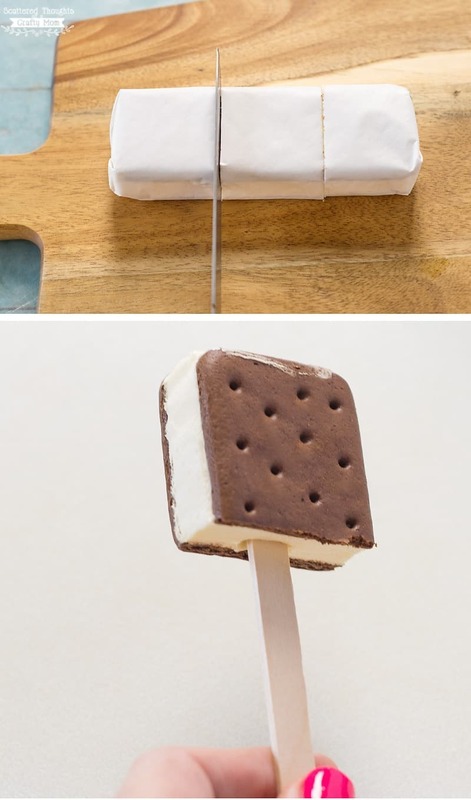 Place the ice cream sandwiches on a flat tray and return to the freezer for about an hour to firm back up. These look great! I love that you used ice cream sandwiches from the store. So simple, but they look so festive!